There was drama at Kotido Central Police Station, Uganda, on Thursday when a local businessman stormed the station to file a complaint against Uganda Wildlife Authority (UWA) for allowing rats to destroy his money. Peter Lojok Longolangiro paraded five rats he accused of destroying Shillings 396, 000 he had kept in a box. He also tendered the damaged notes, which he said were eaten by the rats. 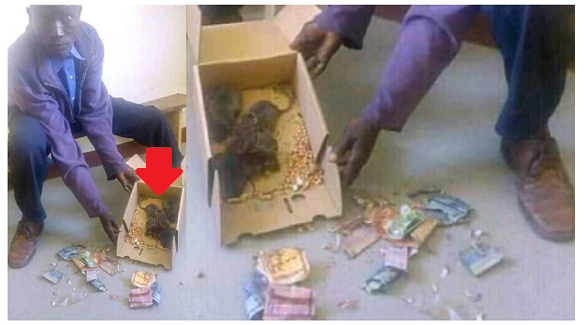 Longolangiro claimed that the wild rats, which are part of the protected species by UWA, intruded into his house and entered the box where he had stored his cash. After hearing from the complainant, police referred him to the Resident State Attorney for expert advice on the case. Alphonse Ojangole, the Kotido District Police Commander told URN he had never come across such a case in his 12- year of service. The Kotido Resident State Attorney, Anthony Obwonyo Jabwor, however said the case lacks merit, saying it should only teach people, especially the business community to bank their money. However, Longolangiro insisted that UWA should pay for the damage caused by the wild rats. The father of ten children said it’s the tenth time wild animals have destroyed his property without any compensation. He noted that last year, he lost all his crops to elephants and other wildlife and nothing was done by UWA. Walter Odokorach, a Community warden in Kidepo wildlife reserve, said it’s unfortunate that Longolangiro has lost his savings to the rats. He however noted that UWA can’t be liable for such actions especially by rats in the house. Two banks namely Centenary Rural Development bank and Stanbic bank operate in Kotido.